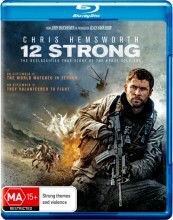 The 12 Strong DVD Blu Ray sees a team of CIA agents and special forces head into Afghanistan in the aftermath of the September 11th attacks in an attempt to dismantle the Taliban. Stars Chris Hemsworth, Michael Shannon and William Fichtner. Click the button below to add the 12 Strong (Blu Ray) to your wish list.